We met Chloe and her brother, Colin, at Snoqualmie Pass, after they finished the stretch from White Pass. John, Chloe's husband, brought clean clothes, food for the next week, spare gear, extra food, with everything all labeled and organized. He also brought Indian food for us to feast on. Chloe had a chance to enjoy a little civilization for the night before heading on to the next section of trail. Then came the inspection. 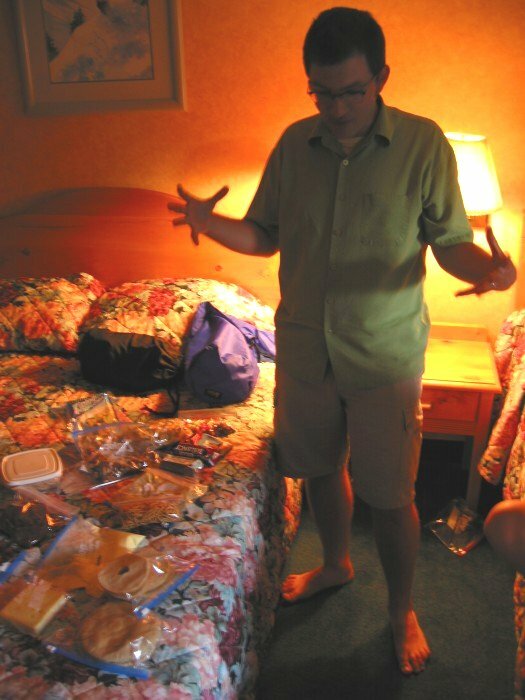 John made sure we had the correct amount of food - fat, protein, calories - to get through our trip with a bit to spare. I was a bit light, so he added a few items from his treasure chest of extra food. He also went through all our gear making sure we only took the essentials and didn't end up taking heavy items when there were lighter alternatives. He shaved several pounds off my pack by swapping out gear or simply forbidding me to take things. Even so, my pack ended up being a lot heavier than Chloe's. Fully loaded with food for a week and water for a day, she was in the mid-20's for poundage, ending up well under 20 when the food was depleted.